I think I am becoming a photography junkie. I find that I’m carrying my camera with me everywhere I go, and when I don’t have it on me, I’m always thinking, "oooh, I should take a picture of that." Deep down, I am still a purist. I’d much rather have a handful of photographs from my SLR than be sitting in front a computer screen scrolling through pictures. But, I guess I’m becoming a sucker for the convenience and immediate satisfaction of digital prints. So, with that said, I have pictures to share today. It has been on my mind lately to get some potatoes out of my pantry and little paint to do some good old fashioned potato-stamping. Several years ago, my college roommate and I ran a nature camp and had so much fun doing this with the kids. So, on a whim today, I finally got out the knife and potatoes and carved two simple squares for stamping. I wanted to do an easy shape, but at the same time, I really like the simplicity of the square in different sizes. Maybe it’s the subliminal mommy square, baby square effect that I’m drawn to. I was having so much fun stamping by myself, and then emma wandered in with two of her own tshirts to stamp. It was lots of fun and I’m pleased with the results. One of Emma’s shirts is on the left, and I did the baby onesie for Mary. Last week, I saw these Chinese Lanterns for sale in a thrift store. I didn’t buy any, but when I mentioned them to my mother-in-law, she said she had them in her back yard garden. So, this afternoon I picked a whole bunch and trimmed off the leaves because apparently they dry really well. I love the vibrant colors. When I was looking for information about them online. 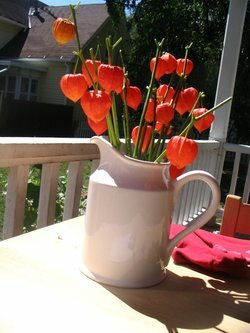 I found this website about a blossom and seed swap. It sounds so interesting. I will have to check it out when I have more time. What a neat idea. While we were picking flowers a yellow jacket landed on Emma’s calf. When she stood up to run away (mostly because her mother was freaking out yelling, "emma’s there’s a bee on you, get up, get up!!") 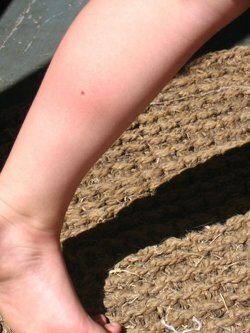 she caught the bee between her calf and thigh and it stung her. Oh, I HATE bee stings. Just as I was typing this, she came into the room in her most dramatic, frail voice and told me that now she won’t be able to do anything– not eat, not play, not nap, not pickup, not go anywhere…all because of her bee sting. It is too much to handle. Lastly, for a dose of reality, and to avoid having my day sound like a romantic afternoon of artwork and flower-picking, let me confess that last night’s dinner dishes are still on the counter, there are wet clothes in the washing machine and wrinkled, unfolded clothes in the dryer, goldfish crackers are swimming around my living rug, and if I rolled around on my carpets for a few minutes, I’d stand up with an extra layer of dog hair for warmth. That is reality. Thank you so much for adding the “dose of reality”. I swear I hear of all these amazing crafty things so many of my mommy blogger friends do and I always wonder how it all gets done. Esp. when most my friends have more kids than me. So it was nice to hear the reality 🙂 I’m hoping as I grow in domestic diva power I can learn to do more cool things around the house. Right now I’m happy if I unpack a box! HA. course I went from pregnancy to child sucking on my chest, to being pregnant again. Needless to say I can’t remember what it is like to have energy. I love the stamped shirts…. cool. The flowers are neat too. Never seen those. you are not alone…i seem to spend more time reading through blogs…getting ideas…and putting off housework and not making much, certainly rarely dinner and mostly each day the best i manage to make is a mess! wow, I really loved what you wrote here… really and truly. because that’s what day-to-day life is… it’s a little bit of everything mixed up with the reality of everyday. 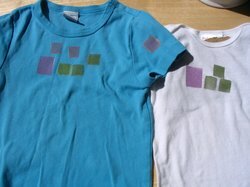 as in, a little bit of fun (potato-stamped shirts… so fun! I am SO doing this with ava), a little bit of magic (the red lanterns are beautiful), a little bit of discovery (awesome blossom and seed swap) and a little bit of tragedy/drama (so sorry about emma’s bee sting… bummer). then mix in the ongoing upkeep of a house filled with children and adults and that’s a full day, folks. my dose of reality: wet clothes in the washer that have been there so long they are probably starting to sour (and will need to be washed all over again), sugar ants raiding a kitchen sink because I don’t get the dishes into the dishwasher quick enoug, a house that desperately needs to be vacuumed. thanks for sharing your dose… it makes me feel a little bit better about my reality! my kids would LOVE potatoe printing…..I’m such a bad mommy:) I hardly ever let them participate in the craft! I need to though!